At 20 years old, Joyce opened her first Doggie Daycare in Marda Loop! How did Sleep Rover Begin? Joyce has had dogs since she was a wee little girl - both parents were dog lovers. Her first real dog, was adopted from the City of Calgary pound, by her mother, when she was 16. JJ came into the pound at just a year old, with her sister, a husky cross lab, and quite the handful - destroying everything in the home, and of course - as smart as can be. However JJ proved to be the light that guided Joyce to her commitment for quality and honest care. JJ ran away with Joyce during her troubled times, understood her through her dark times and uplifted her to her first attempt at a dog daycare, called Doggiessentials Daycare in Marda Loop. With long hours at the U of C in education, and 3 jobs to keep them both afloat - JJ spent many hours and days alone. The guilt pushed Joyce to open her first daycare. Although successful, her then relationship was too young and fragile, and quickly the business dissolved as quickly as it became successful. Joyce then ventured into corporate, working for Bell, then real estate and legal in Saskatoon for a few years, before flipping a few houses to save up, for the branch back to Calgary, to start Sleep Rover in 2009. Sleep Rover opened doors November 1st of 2009 right by the airport - on Mcknight and Deerfoot on Skyline Crescent. At approximately 3500 sq.ft. of indoor dog fun, and 6000 sq.ft. of outdoor space - it was a dream come true. Sleep Rover set the new standard for dog care. Staffed 24/7 and allowing all breed dogs to socialize and be cared for, in an open concept facility. Home away from Home. 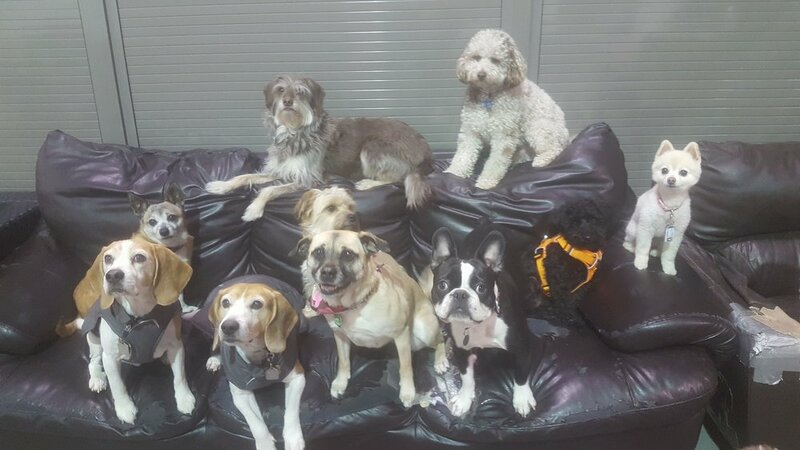 Sleep Rover's clientele quickly grew in 3 years, with word of mouth to almost 2000 Calgarian dogs. 5% of our clientale are from other cities, from as far as Montreal. By year 4 - it was time to find a larger location, to accommodate the best cared for clients in Calgary, because of the amazing caregivers it employs. Soon the tag line of 'Where Friends Become Family' came into effect for 2015. In our clients, in our staff, we are a family. The hardwork and stress prevailed for a move in Dec 2015 to our current location, Sleep Rover on 37th which includes Calgary's first indoor Dock Dog Pool and space for local dog trainers to train. As we love Meetups, we started hosting our first Breed Meetup in 2016 - and plan to hold Meetups once a month for dog lovers. We thank all those that vote for us each year - however I am working on pursuing these awards nominations, as I have a huge fear of public speaking and attention, being a forced introvert. Although I know it is important for our hardworking employees, I feel I have let them down for the awards we have been voted for, over the last two years. My goal for 2017 is to pursue these, and work past my fears. 2017 BEST DOG DAYCARE WINNER!